On July 24, part of Pence’s sit-down interview with Sinclair chief political analyst and former Trump aide Boris Epshteyn was shared online . 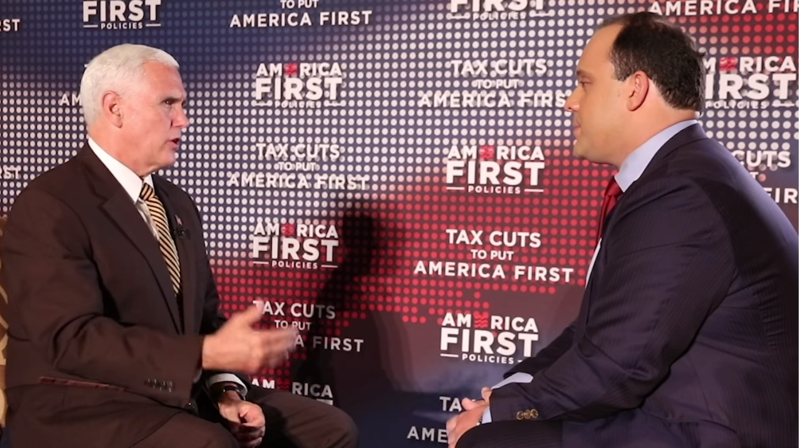 In this latest “Bottom Line With Boris” segment, Epshteyn and Pence discuss how “President Trump has been delivering on his promise: to cut taxes for working families and businesses” thanks to the Republican tax overhaul known as the Tax Cuts and Jobs Act. In reality, the legislation predominantly benefited large corporations , and wages  have actually fallen by 1.8 percent  since the cuts were enacted. Epshteyn does not mention this in the segment, but rather asks the sorts of vague questions that set Pence up to use the interview as an infomercial for Trump and the Republican party. This interview segment will now air as “must-run” content on more than 100 Sinclair-owned and -operated local TV news stations across the country. As of publication, a Media Matters search of the iQ media database shows the segment has already aired in at least 20 states. There will be at least one more excerpt from the interview released as an additional segment in the coming days -- according to Epshteyn’s newsletter, the next Pence segment  will focus on Judge Brett Kavanaugh’s nomination to the Supreme Court. The fawning Pence interview is just the latest entry in a long list of friendly connections  between Sinclair and the Trump inner circle. Sinclair has previously aired softball segments with at least six  other administration officials, as well as Trump lawyer Rudy Giuliani . Hours after the Pence segment was first posted online, President Donald Trump tweeted  a defense of Sinclair, signaling displeasure with a recent and surprising Federal Communications Commission (FCC) decision  to send Sinclair’s proposed acquisition of Tribune Media to its likely doom. Trump tweeted that an even larger Sinclair “would have been a great and much needed Conservative voice for and of the People.” Had the deal been approved, pro-Trump propaganda like these interviews would have reached  more than seven in 10 American TV households.